Blender uses a right-angled “Cartesian” coordinate system with the Z axis pointing upwards. Left/Right corresponds to looking along the X axis, Front/ Back along the Y axis, and Top/ Bottom along the Z axis. 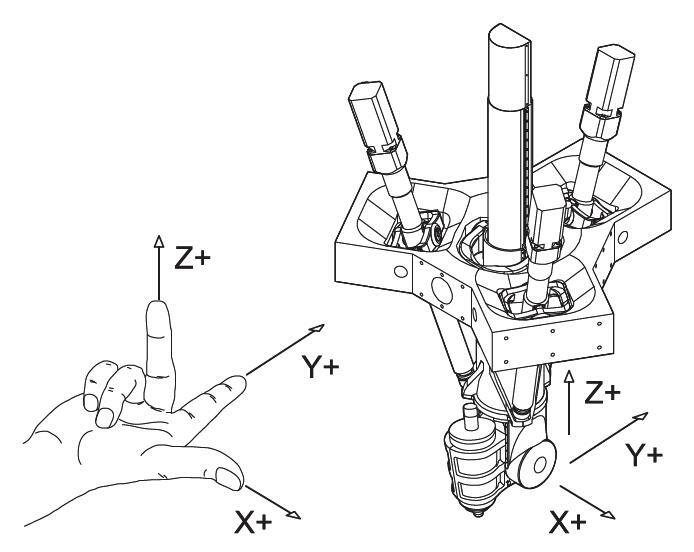 For right-handed coordinates your right thumb points along the Z axis in a positive Z-direction and the curl of your fingers represents a motion from the first or X axis to the second or Y axis. When viewed from the top or Z axis the system is counter-clockwise. For left-handed coordinates your left thumb points along the Z axis in a positive Z-direction and the curled fingers of your left hand represent a motion from the first or X axis to the second or Y axis. When viewed from the top or Z axis the system is clockwise.